Our client requested, "a room, a home, that hugs you when you walk in." We like to think this room is the physical equivalent of a warm hug. Functionality and comfortability were our primary focus in this design. Everything, from the the soft and cushy carpet to the durable, slipcovered sectional, had livability and comfort at the forefront of the choice. Keep reading for more details and photos from this Family Room transformation. Before, builder grade colors and furniture filled this family room in Herndon, VA.
After: no more builder basic. Now a custom sectional, rug, and window treatments have wholly upgraded this family room in Herndon, VA. 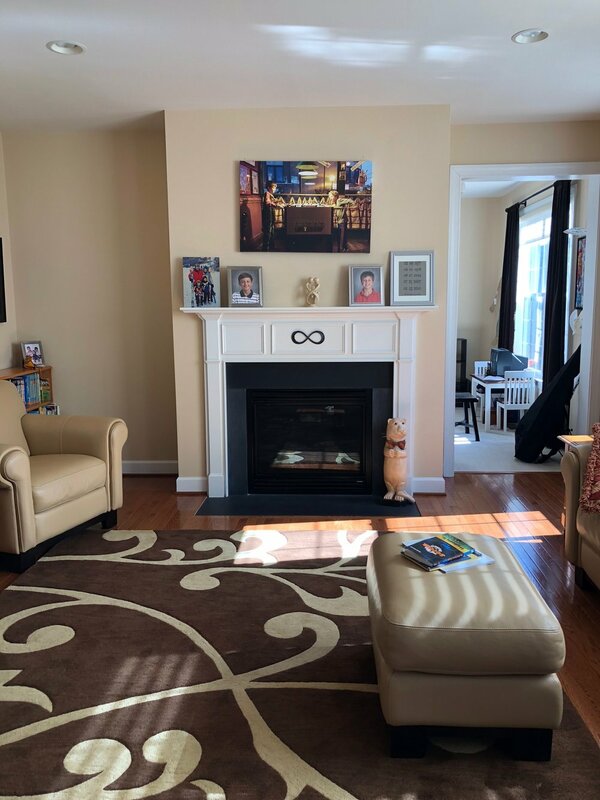 The family room after in Client "First Floor Refresh" in Herndon, VA. The biggest design aspect of this room was spatial planning. The sectional and the rug were made to exact measures. Creating a cozy, not crowded family room, was the ideal; plenty of room for people to sit, plenty of room for people to lay out on the floor, plenty of space to play games, and plenty of cozy and comfortable textures. Before, Client First Floor Refresh's Family Room in Herndon, VA.
New coffee table and media stand. Custom sectional by Moss Studio. Custom Rug and throw pillows. New light fixture. Eat-in kitchen before from Client "First Floor Refresh" in Herndon, VA.
New light fixture over eat-in table, new pendant lighting over kitchen island, new wallpaper by Cole and Sons. We chose a calm and neutral paint color to balance the existing hardwoods and kitchen cabinets. And then, went for bold in the eat-in with a graphic wallpaper that takes your breath away (in a good way!) The clients LOVE this wallpaper, and has added so much interest and light. The whole first floor has undergone an amazing change and our clients couldn't be happier to call this their home. Thank you Susan, Alex, and family, for letting us work in your home! Older PostClient "Turning-down for an Update"